Based in Montreal for more than 35 years, Lorraine still has the bearing of a queen. Through her mother the legendary South African singing star Thandie Klaasen, this unique child decoded the authentic grooves of her country’s Townships. And yet, it is in Montreal that she chose to build her life and give birth to her children. Then came a brilliant solo career, during which she has delighted music lovers with her irresistible mix of South Africans sounds strongly spiced with West Indian flavors. Having taken home a Juno for World Music Album of the Year in 2013 for her tribute to fellow South African Miriam Makeba, as well as the SOCAN award as chosen by her peers the following year, Lorraine knew that the bar had been raised for future projects. She decided to call on a trusted man and a long-time friend. Based in Washington, the incomparable guitarist and producer Mongezi Ntaka, with whom she had already worked in the past on the album Africa Calling (2008), did not hesitate for a moment and came up to Quebec. Others on board for the project are the brilliant Congolese drummer Noel Mpiaza and Haitian musician Medad Ernest contributing his jazz and gospel groove on the accordion and keyboards. Local musicians completing the roster of participants are Assane Seck, the most in-demand Senegalese artist in town, brothers André and Ross Whitman (of the famed West Indian Soca band Jab Jab) as well as Quebec double-bassist Cédric Dind-Lavoie, who has become a fixture on the local world music scene. And just to add a little extra dynamite to the mix, an irrepressible trio of young black backing vocalists (Anne Metellus, Melissa Gresseau, Cynthia Binette) give added tone and infuse some youthful energy into Lorraine Klaasen’s repertoire. Nouvelle journée is an optimistic, danceable record but also a lucid, sincere and engaged work. Not holding back, Lorraine sings in Tsonga, Sotho, IsiZulu and Xhosa – tribal languages of her home country – as well as in English, all with her charming Soweto accent. The title track even features her singing in French for the first time! 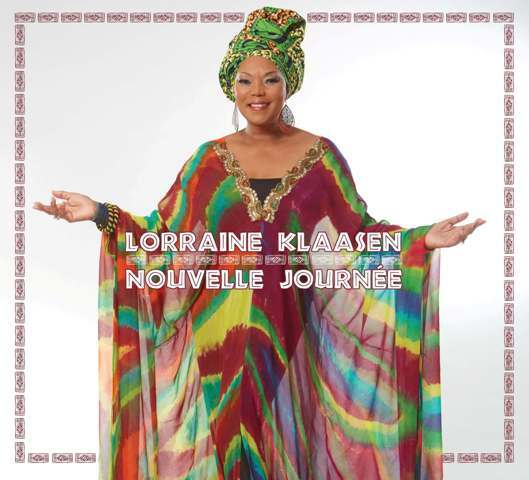 Lorraine Klaasen pays tribute to her mother by covering Izani Nonke, a song that stridently criticizes those elected to govern us. “Never trust a politician”, she sings, and goes on to deplore the lack of ethics displayed by these untouchable, high-placed figures, described as “dishonest puppets” who profess to love the people, all the better to fleece and abuse them. Sadly, this remains so very pertinent today. Nonetheless, Nouvelle journée translates as New Day, and it represents a new beginning! In anticipation of the pending return to the concert scene of Lorraine Klaasen, a born stage performer if there ever was one, we can start the hips shaking and the feet tapping by listening to Township Memories, Polokwane or else Babalazi (Hangover), which brings to mind the South African mega hit Pata Pata. Radiating beauty and an eternal youthfulness, always flamboyant with her turban shaped like a crown, Lorraine is a natural queen. Our South African queen right here in Canada.